Elements of the 25th Inf. Div. 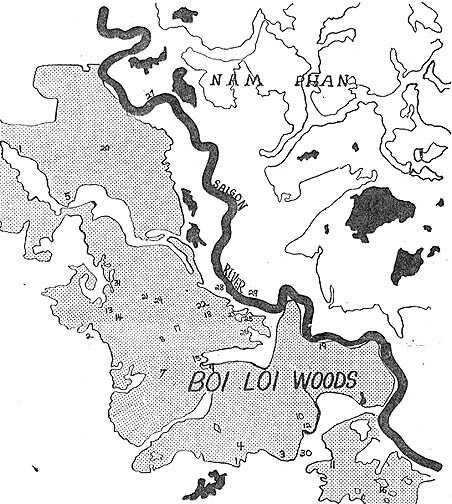 on operation "Manhattan" killed three Viet Cong and detained eight others while searching the heavily vegetated Boi Loi and Ho Bo Woods, 56 kms north of Saigon. Units from the "Tropic Lightning" Division's 1st Bn. (Mech), 5th Inf., killed three guerrillas and detained seven prisoners in the northern edge of the Ho Bo Woods during a brief but violent fire fight with an enemy force of unknown size. COL M.D. Fuller, 2nd Bde. commander, was in his command helicopter over the area when he spotted several VC running across an open field. As the guerrillas reached the woodline, COL Fuller noticed the movements of a larger group. Circling overhead, he directed artillery fire into the woods and called in helicopter gunships to seal the area off. Meanwhile, he directed elements of the mechanized infantry to close with the guerrillas. One Viet Cong was killed after he fired on an armored personnel carrier with an RPG-2 rocket launcher. Five others were spotted entering a tunnel and were taken alive. Two more VC were detained and one additional guerrilla was killed while trying to escape from the aggressive infantrymen. One prisoner was also detained by the 3rd Bde., 4th Inf. Div., operating with the 25th Division. Tropic Lightning infantrymen also captured four small arms, a rocket launcher and rocket, five pounds of medical supplies, 17 tons of rice, 3000 cans of milk, and 15 pounds of documents. During the first nine days of Operation "Manhattan" more ammo has been found by the 25th Inf. Div. than in all of 1966, according to LTC Guy W. Troy, assistant chief of staff, intelligence (G-2). Locations of numerous caches found during this period are indicated numerically. The map does not include the entire "Manhattan" operational area. Locations are approximate and numbers do not include all caches. Found were: (1) four underground fortifications (UFs), seven CHICOM claymores and 20 carbines; (2) 30 UFs, 50 foxholes, 12 M-79 rounds and three CHICOM claymores; (3) 21 French rifles; (4) four CHICOM claymores, 17 lbs TNT and 30 claymore castings; (5) three tons of rice; (6) 152 lbs medical supplies and 50 lbs clothing; (7) 23 UFs; (8) 43 booby traps, 384 81mm and 82mm mortar rounds, 100 60mm mortar rds, 105,836 rounds small arms ammo, 2100 lbs demolitions, 800 feet primer cord, 1500 lbs cement, 3200 blasting caps, 71 CHICOM carbines, 119 Mauser rifles, 29 Soviet light machineguns and numerous other weapons; (9) 208 lbs clothing; (10) 90,000 lbs rice and 600 lbs fish; (11) VC base camp; (12) 600 lbs fish, 150 sheets of tin and 45 tons rice; (13) 41 UFs; (14) 40 UFs; (15) 200 lbs TNT, 1500 lbs cement, 300 lbs lime, 130,000 rounds small arms ammo and 500 4.24 batteries; (16) 14 tons rice; (17) 12 claymore mines, 500 feet detonating cord, 3000 blasting caps, 84 AP mines, seven 75mm recoilless rifle rds, 60 80mm mortar rounds, 324 82mm mortar rounds, 1600 lbs TNT, 10 booby traps and 57,836 rounds small arms ammo; (18) 7500 lbs rice; (19) 46 UFs; (20) five tons rice; (21) VC commo center with misc. radio equipment; (22) 35 tons rice; (23) 50 tons rice; (24) 16 UFs; (25) 3000 cans milk and 12 tons rice; (26) numerous sampans; (27) 900 cans milk, 40 lbs clothing, 200 lbs medical supplies and 35 blankets; (28) numerous tunnel complexes. The 34th ARVN Ranger Bn. has uncovered a Viet Cong hospital and base camp area deep in the Boi Loi Woods. The Vietnamese unit is conducting search and destroy operations in conjunction with the 2nd Bde. of the 25th Inf. Div. in the dense jungle area. The hospital, complete with over 200 pounds of medical supplies, was discovered by the unit as they methodically searched the heavily wooded Viet Cong stronghold. The medical supplies, 40 military uniforms, 25 blankets, and several small arms were either evacuated or destroyed by the soldiers of the unit. The men of Co. C, 1st Bn. (Mech), 5th Inf. recently discovered just how fast the Viet Cong can change a safely cleared area into a deadly trap. "Charlie" had made his point with three "stick mines." Another element of the 25th Div. unit had led the way without incident through a large open area. Moments later, as the armored personnel carriers (APCs) of Co. C rumbled down the trail made by the first unit, the lead vehicles slammed to a stop. The Viet Cong had neatly planted three "stick mines" right in the track prints the drivers were following. The stick mine is a large anti-tank mine triggered when a vehicle rolls over an upright metal or bamboo stick. The mines were safely blown in place. "If anyone had been sitting in the left seat, it would have been all over," said WO Walter Cooke, describing his run-in with Viet Cong ground fire over the Boi Loi Woods during Operation "Manhattan." 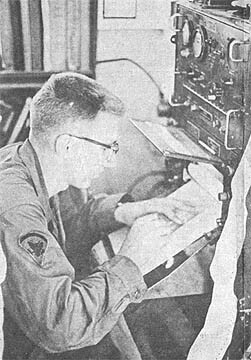 Cooke, a pilot for the 25th Inf. Div. 's 2nd Bde. Aviation Section had just lifted his tiny observation helicopter above the dense jungle when he heard the cracking of automatic weapons fire around him. "Just as I began to swerve the ship to escape the fire, three rounds hit," said Cooke. Two rounds went through the open door next to his head and crashed through the aircraft's plastic bubble. A third round ripped through the left passenger seat and up through the bubble. Cooke had dropped off two passengers just moments before and was on his way to another mission. "The whole thing didn't bother me until I realized just how close those rounds came to my helmet," said Cooke. He has been in Vietnam for less than a month. DUC PHO - In the first seven hours of Task Force "Oregon," the 3rd Bde. Task Force, 25th Inf. Div. killed 45 Viet Cong in a battle on the coast near here. Thirty VC were killed by 1st Bn., 35th Inf., "Cacti Green" automatic weapons fire, and 15 more by artillery fire thrown into the area. Five U.S. soldiers were injured, none seriously. The "Bronco" Brigade, after completing Operation "Pershing" south of Bong Son and after participating in the final two days of Operation "Lejeune," closed in on the Duc Pho area by air and sea April 19 to begin Oregon. The brigade's sea assault was the first of Task Force Oregon. It initiated one of the rare sea resupply routes (Qui Nhon to Duc Pho) established by the Army during the Vietnam War. Earlier, on April 16, the 2nd Bn., 35th Inf. was the first element of the 25th Div. to battle VC in Duc Pho District, killing 43 and suffering only one slightly wounded U.S. casualty. District intelligence sources estimate the population around Duc Pho District to be 75 per cent Communist, an indication that Duc Pho should occupy U.S. forces for quite awhile. Oregon is being conducted near Duc Pho in I Corps area. MG William B. Rosson is commanding general of the Task Force. LTC George S. Webb., Jr., HHT, 3rd Sqdn., 4th Cav. SP4 Clarence F. Gipson, Co. A, 4th Bn., 9th Inf. SP4 Garland A. Newhouse, Btry. B, 2nd Bn., 77th Arty. SGT Gary Brooks, Co. A, 4th Bn., 9th Inf. SP4 David D. Berkholz, Co. A, 2nd Bn. (Mech), 22nd Inf. SP4 James R.. Hintz, Co. B, 3rd Bn., 22nd Inf. SP4 David C. Rogers, Btry. C, 2nd Bn., 77th Arty. PFC Thomas L. Bell, HHC, 3rd Bn., 22nd Inf. PFC Jack R. Trim, Co. A, 4th Bn., 9th Inf. MAJ Michael J. Kubas, HHC, 1st Bde., 25th Inf. Div. CPT Walter B. Stewart, Co. A, 25th Avn. Bn. CPT Robert F. Winters, HHB, 7th Bn., 11th Arty. 1LT Frank S. Owen Jr., Co. B, 25th Avn. Bn. WO1 James P. Barry, Co. A, 25th Avn. Bn. WO1 Jon C. Jensen, Co. A, 25th Avn. Bn. WO1 Heriberto Vasquez, Co. B, 25th Avn. Bn. SP4 Chester G. Atkins, Co. B, 25th Avn. Bn. SP4 Andrew E. Carr, Co. A, 25th Avn. Bn. SP4 Robert E. Masterson, Co. A, 25th Avn. Bn. SP4 Leo B. Miller, Trp. D, 3rd Sqdn., 4th Cav. SP4 Gene E. Nix, Co. A, 25th Avn. Bn. PFC Gerald D. Arnold, Co. A, 25th Avn. Bn. PFC John B. Decausmaker, Co. A, 25th Avn. Bn. PFC Paul D. Eaves, Co. A, 25th Avn. Bn. PFC Johnny L. Edwards, Co. A, 25th Avn. Bn. PFC Joseph C. Fazio, Co. A, 25th Avn. Bn. PFC John E. Gannon, Co. A, 25th Avn. Bn. LTC Edward P. Davis, HHD, 25th Avn. Bn. CPT John C. Cartland Jr., HHB, 2nd Bn., 77th Arty. CPT Herbert Kuhl, HHC, 4th Bn. (Mech), 23rd Inf. CPT William W. Little, HHC, 4th Bn. (Mech), 23rd Inf. CPT Michael J. Lombardo, H&S Btry., 7th Bn., 11th Arty. CPT Benjamin J. McPherson, 25th Admin. Co.
1LT Charles Dickey, Co. B, 1st Bn. (Mech), 5th Inf. 1LT Ronald L. Johnson, HHC, 2nd Bn., 14th Inf. 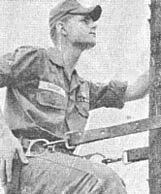 1LT Gary L. Meyer, HHB, 25th Div. Arty. SFC Nelson K. Hayashi, 25th Admin. Co.
SSG James E. Bostock, Co. A, 1st Bn. (Mech), 5th Inf. SSG Benjamin F. Kelly Jr., HHT, 3rd Sgdn., 4th Cav. SSG James K. Lindsey, Co. A, 1st Bn. (Mech), 5th Inf. SSG William T. Webb, 25th Admin. Co.
SGT Walter R. Blalock, A Trp., 3rd Sqdn., 4th Cav. SGT Loyd L. McBroom, Co. C, 4th Eng. SGT Larry R. Scott, Co. A, 65th Engr. Bn. CPT Wilfried H. Kast, Co. B, 25th Avn. Bn. 1LT Gerald R. Abbott, Co. C, 1st Bn. (Mech), 5th Inf. 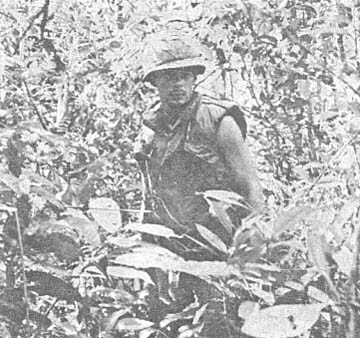 SFC Miguel A. Perez, HHC, 2nd Bn., 14th Inf. SSG Walter L. Boardwell, HHC, 4th Bn., 9th Inf. Legislation now before Congress proposes a 5.6 per cent basic pay increase for members of the Armed Forces. In this pay bill, the Department of Defense sent a request simultaneously to the Speaker of the House and the President of the Senate as part of the Defense legislative program. The measure has been referred by both houses to their Armed Services Committees. The chairman of each committee has introduced an identical bill on the proposal. In a bill of this nature, hearings are normally held and Defense Department officials asked to testify. Once in a committee, the bill may be amended. Assuming a favorable report is made by the committee, the bill is then sent to the floor of the House or Senate to be debated. At the end of the debate, a voice or roll-call vote is taken and if the bill passes by a majority, it is sent to the Senate (assuming the House acted first) where the House bill is considered. If the Senate has not yet held hearings on its bill, it will consider the House proposal, but may amend it and report out a new bill. If the House and Senate debate their own bills and pass them with any differences between the two or if an amended version of the House bill is passed by the Senate, a conference committee is appointed by each House to resolve the differences. Once approved by both House and Senate, the bill is sent to the President. The bill becomes law after it is signed by the President or when passed a second time by a two-thirds vote of Congress over a Presidential veto. If the President holds the bill 10 calendar days (excepting Sunday) without signing it, the bill automatically becomes law. However, if Congress adjourns during the 10 days, the bill is automatically killed. A day in May is set aside each year to honor those men and women serving in the Armed Forces of the United States. May 20 is the day proclaimed for that purpose in 1967. President Johnson stated, "Our modern military establishment is the mightiest arsenal of all time. But it would give us neither peace nor security without the devotion to duty, the courage and sacrifice of the men and women who wear our country's uniform." The 25th Inf. Div. will have two USO shows at the Cu Chi Base Camp this week. Thursday brings the popular "Inkspots" to Lightning Bowl. Sunday; May 21, famed columnist Ann Landers will visit the Tropic Lightning area. Both shows are presented through the 25th Division Special Services Office. Another raise in military pay is in the mill. The $500 million military pay proposal has been sent to Congress by President Johnson. If approved, the increase will mean a flat 5.6 per cent across-the-board boost in basic pay for all military personnel. It also calls for small increases in quarters allowances for some. President Johnson said, "For our military personnel, pay alone can never reflect the full measure of our debt. On the battlefields, in outposts where there is tension but no battle, in the vast defense installations of our country, these men and women protect our national security." The President continued, "We must assure them and their families that they will be compensated for their service on a scale which is comparable to that of their 2.5-million civilian co-workers." The commander-in-chief concluded with "As civilian pay goes up, so should the pay of the Armed Services." The President has recommended that the increases take effect on the first day of Oct. 1967. Johnson also took note of the "searching review of the principles underlying the military compensation system" underway within the Department of Defense for the past year. He commented, "When these studies have been completed, I will recommend further changes in the Armed Forces pay system." The new increases in basic pay recommended by the President range from $5.10 per month for a raw recruit to $112 per month for four-star officers. A SFC under 10 years but over eight will go up to $390. A MAJ with 12 years' service will receive an extra $41.40 per month and a COL with 20 years' service will get a boost of $59.50 per month. The Morning Report, a venerable Army document dating back to George Washington's day, will take on a new, streamlined look this summer. DA Form 1, the basic record reflecting the official status of the reporting organization and each person assigned or attached to it, will be simplified to eliminate causes of common mistakes. The major change of the revised form, prepared by the U.S. Army Data Support Command, is the elimination of the personnel information that has been traditionally known as "supplemental data." This information will now go directly to the Data Processing Activity from the personnel office that is the custodian of the individual's military records. This will eliminate much of the administrative workload from the duties of the Morning Report clerk. The military services have established a board to allocate and control on a world-wide basis the distribution of selected items of ground ammunition that are common to two or more services. The board, called the Military Services Ammunition Allocation Board, was created by mutual agreement of the Chiefs of Staff of the Army and Air Force, the Chief of Naval Operations, and the Commandant of the Marine Corps. God of our fathers, who hast made us heirs of brave and faithful men and women, accept, we pray Thee, this Armed Forces Day, our humble gratitude for the boundless blessings which they have bequeathed to us. Grant that we may prove worthy of their heroism and sacrifice. We commend to Thy keeping all who are serving in our Armed Forces on land, sea and in the air. May Thy gracious Providence watch over them and guide them to victory and honor in defense of our nation and principles. In all things may they know Thy power and presence. We thank Thee for the innumerable spiritual and material resources of our servicemen in their struggle for a just and lasting peace. Make us mindful of our own responsibilities to mankind. Be our refuge and strength so that in all battles of life we may be valiant in our service to Thee and beloved country. Amen. Sixty-six years ago at Plattsburg, N. Y., a new regiment was born - the Twenty-seventh United States Infantry. On May 2, while on combat operations deep in the Boi Loi Woods, the 27th Inf. "Wolfhounds" celebrated their 66th birthday and heritage as one of the hardest fighting units in American history. Although the 27th Inf. was organized Feb. 1, 1901, their organization day is celebrated on May 2 of each year to commemorate their victory over the Moros in the Philippines at the Battle of Bayan. That battle was the first in a long string of combat engagements for the Wolfhounds. President Theodore Roosevelt wired the regiment after the battle: "...my congratulations and thanks for the splendid courage and fidelity which has again carried our flag to victory." COL Frank D. Baldwin, commander of the regiment at the battle was one of the few Americans who have twice won the Medal of Honor. The 27th earned the nickname Wolfhounds during eleven battles they fought in Siberia. Because of their swiftness and ferocity in combat they were named after the Russian Wolfhound (Borzoi) that is widely known for its gentleness to friends and viciousness to enemies. In October 1941, the 27th became part of the 25th Inf. "Tropic Lightning" Div. The first shots fired at Japanese planes swooping down in their murderous attack on Pearl Harbor were fired by the 27th. The Regiment was ordered into action in the South Pacific in November 1942 where they relieved the Marines on Guadalcanal. There they participated in three major battles. The unit then moved on to the Northern Solomons where they drove the enemy from the Northern Arundel and Sagekarasa. They halted an attempt by the enemy to retake the vital Munda airfield at New Georgia, and forced the invaders from Kolombangara. In January 1945, the Wolfhounds returned to the Philippines where they fought in nine major battles. They destroyed one fourth of the enemy armor on Luzon in a campaign through the Central Plains. The 27th remained in the Philippines until they moved in January 1947 to Camp Sakai, on the outskirts of Osaka, Japan. There, MSG Hugh F. O'Reilly (now retired) visited the Osaka Orphanage at Christmas in 1949. Shocked at the conditions the children were living in, he started a collection to support a better home. The Wolfhounds adopted the orphanage and , with the help of the 1st Bn., 8th Arty., have through their contributions made it one of the finest homes in the country. In June 1950, as the regiment continued training in Japan, the Communist North invaded South Korea. The Wolfhounds closest to the emergency were thrown into battle at Pohang Dong, Yonil, and Adong. They were then made a part of the Eighth Army Reserve. There, for more than a month, they moved along the Puson Perimeter "putting out the fires" started by the Communists. In four days of particularly heavy fighting, the unit inflicted more than 3000 casualties on the enemy at Sangyong-ni. For their action, the 27th Inf. was awarded the first Distinguished Unit Citation of the war. Before the end of the war, the unit had fought in eleven campaigns, had earned four Distinguished Unit Citations, and five of her men had been awarded the Medal of Honor. When the truce was signed the unit was selected to be the Honor Guard at Panmunjom. In October 1954, the unit returned to Hawaii. 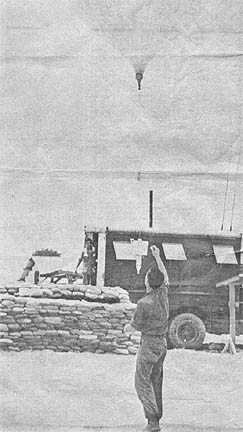 In 1962 they were sent to Thailand for a brief exercise, and in January 1964, now a part of the 2nd Bde., they conducted a test of the Forward Floating Depot Concept on Okinawa. Late in 1965, the brigade, made up of the 1st and 2nd Bns. of the 27th and the 1st Bn. of the 5th Inf. were alerted for deployment to Vietnam. After landing in Vung Tau on Jan. 18, 1966, they fought for nearly two months to secure the Cu Chi base camp. From that date, the Wolfhounds have taken part in continuous combat operations for fifteen months. Both Battalions of the 27th Inf. celebrated 66 years of tough, proud history. The birthday was celebrated under Viet Cong fire deep in the Boi Loi Woods during Operation "Manhattan." DUC PHO - Alpha Company, 2nd Bn., 35th Inf. has been under constant enemy fire from all sides and potentially from below ever since they landed in LZ Shoupe a week ago. It was discovered Wednesday, two days after Co. A had been at Shoupe, that Shoupe itself is located on top of a vacated VC tunnel complex. Five entrances to the tunnel were discovered, one of which was outside the perimeter. Cpt Luis Barcena, of Miami, Fla., has made constant use of air and artillery fires to act on numerous sightings of VC in this area where 75 per cent of the population is VC. Twelve Viet Cong were killed by direct hits from 105 mm rounds and two more direct hits on bunkers caused secondary explosions, destroying VC stored ammunition, as artillery fire was brought in on a presumed vacated VC base camp Thursday. The "Cacti Blue" have made themselves right at home as they now utilize the bunkers built by the VC around the complex for their own defensive use. WATCHING children from the village of Tan Thoi frolic on a new piece of playground equipment is MG John C.F. Tillson III (2nd from right), 25th Inf. Div. CG. The equipment was built for the children by men of the 3rd Sqdn, 4th Cav. Also watching the fun are (from left) CPT Dennis L. Fontaine and LTC George S. Webb, both of 3/4 Cav., and CPT John P. Otjen (right), the general's aide. DAU TIENG - A new man to the Ivy Div'.s 3rd Bde., learned that it doesn't take long before you're in combat. Three days after PFC Clyde A. Renand of Slidell, La., joined the first platoon of Co. C, 3rd Bn., 22nd Inf., he was out on operations. It was a bad night even for a veteran: it was exceptionally dark and the rain was falling in torrents. "I wasn't expecting anything to happen, because it was early, then all of a sudden the trip-flare went off." Renand continued, "I fumbled with the safety on the Claymore mine and it finally went off killing three of the Viet Cong just 10 meters to our immediate front. "If it hadn't been for that trip flare the VC would have walked in on us because it was dark and raining hard," Renand said. The next morning, Co. C made a sweep of its perimeter which produced three dead and one live, but very scared, Viet Cong. The searchers also found four rifles, grenades and a complete medical kit, wrapped in a Claymore mine carrying bag. DUC PHO - Always trying to improve their "batting average" the 1st Bn., 35th Inf. has started a small unit combat leader course. "We plan on having one class every month in an effort to re-emphasize the basic skills of the infantry and to train future fire team leaders," said MAJ James E. Moore Jr., the "Cacti Green" commander. "The enthusiasm demonstrated by the students indicates to me that they appreciate the course and think it's valuable." Students selected for these classes have been in combat situations and are judged to be squad leader material. SP4 Jerry L. Young from Baltimore, part-time point man for Co. B, thinks "These classes are helpful; they refresh my memory on procedures that can win battles and save lives." Another student, Eugene T. Harris Jr., from Glenolden, Pa., a rifleman in Co. A, said, "I have learned some practical things I was never taught in A.I.T. and I'm going to pass on all this information to the other members of my unit." Most of the classes are a review of skills the soldiers had learned in either basic training or Advanced Individual Training. Courses include: map reading, ambushes, immediate reaction drills, identification of booby traps, combat assaults and extraction procedures. In addition, other classes, such as forward observing procedures (F.O. ), introduce new skills which were not covered in stateside training. ". . . We of the First Team would like to pass on to you and your command our congratulations on a job well done . . . The 3rd Brigade Task Force has shown itself to be fearless, aggressive and inspired with the will to win. Its success in the Crescent, Nui Mieu, Soui Ca and Crazy Horse (during Operation "Pershing") add impressive pages to the distinguished history of this outstanding unit. "The loss of the 3rd . . . will be felt throughout the division. Having worked side by side with our brigades, we have come to consider the 3rd Brigade Task Force as a member of the First Team. "We of the 1st Air Cav Div., salute the men of the 3rd Brigade Task Force, 25th Inf. Div. and wish them well in the future." DAU TIENG - Each enlisted man of the 2d Bn., 12th Inf has a brand new club of his own. Requiring some $1000 and only about seven days of hard labor, neighboring Vietnamese villagers constructed the hootch strictly from bamboo shoots and completed it with a waterproof thatched roof. Situated immediately adjacent to the NCO club built some two weeks previous from the same plan, the EM club provides the footsore soldier a place of rest and relaxation when he returns from the field. "This instrument is a radiosonde. It is not dangerous and is of no further use to the government. Do not return." This is the obituary of a delicate piece of equipment that is most essential to the mission of the 25th Inf. Div. Arty . . . that of putting artillery rounds in the place where they will do the most good. In order to get a round on a target the Fire Direction Center (FDC) must consider many factors other than elevation, deflection, powder charge and range. The FDC must know the ballistic air conditions that will affect the projectile on its way to the target. Getting this information is the job of the Division Artillery Meteorology (Metro) Section. As CWO Jame T. Kamago of Salt Lake City, Utah, the DivArty Metro Officer, remarked, "We don't predict the weather, we just measure the actual conditions as they pertain to artillery. However, the Air Weather Service uses the information we obtain on the upper atmospheric conditions." The radiosonde, carried aloft by a hydrogen-filled balloon, is the measuring instrument used to record, and transmit back to the plotting van, the current atmospheric pressure, temperature and humidity. These readings are then converted to ballistic temperature and density. In addition, the flight of the balloon is tracked by a Rawin Set, giving the wind speed and direction. For artillery purposes these readings are taken up to an altitude of 18,000 meters. 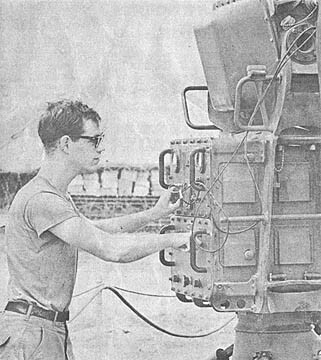 After all the information has been recorded, interpreted and converted for artillery usage it is forwarded to the FDC where they compute the effect the current atmospheric conditions will have on the flight of the various sizes of artillery rounds and assure a metro correction to all firing batteries. The importance of these metro corrections is emphasized when it is noted that certain air conditions can cause a deviation of up to 25 per cent of the range. The average flight of each balloon is one and one-half hours and the section releases four balloons daily. In addition to the "Tropic Lightning" artillery, other units within a 32 km radius of Cu Chi utilize this metro data. PREPARE FOR TAKEOFF - PFC William J. Morgan of Los Angeles, Calif., and PFC Craig Cahill, right, of Oakland, Calif., attach the radiosonde to the balloon as launch time nears. The launching reel, laying on the floor, is used on windy days to attach the radiosonde to the balloon instead of the usual 20 meter length of cord. 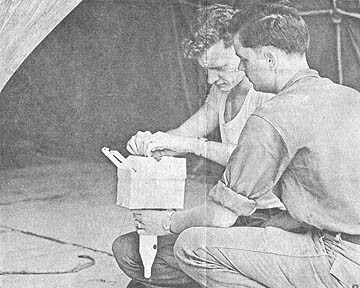 FOLLOW FELLOW - When the balloon is launched, PFC Henry J. Wynsen of Columbus, Ohio, checks the tracking Rawin Set to insure it is locked on the frequency of the radiosonde. As the set follows the flight of the balloon, it records the wind direction and velocity. 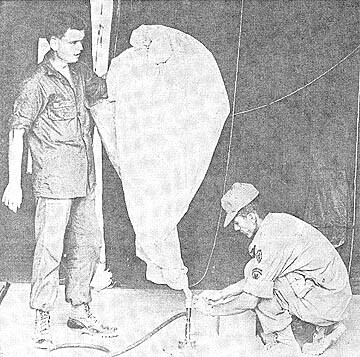 PSSST - PFC Cahill, left, and SP6 David B. Arriola from Guam, NCOIC of the Metro section, attach the balloon to the filler pipe. "Free Lift" is reached when the balloon has been filled with sufficient hydrogen to lift the 3200 grams of weights attached to the bottom of the filler. CHARTING, CALCULATING AND CHECKING - SP5 Gary W. Krahl of Milan, Ill., operates the radiosonde recorder and is recording temperature, humidity and air pressure on the graph paper as it comes out of the recorder. END OF COUNTDOWN - The balloon is off as PFC Cahill releases it. For the next hour and a half, the average flight time of each balloon, will be a busy one for personnel of Metro as they plot the information received on the present air conditions. Although they've occasionally been accused of being a fly-by-night outfit, the Teenie Weenie Air Transport Service has already logged more than a year's service from Cu Chi Army Airfield to various scenic points in III Corps. Teenie Weenie Air - or TWA as 25th Div. wags call it - has its chairman of the board and president, but vice-presidents in charge of scheduling and scrounging (who do most of the work) are two division headquarters majors - George Newton and Charles Houser. Their official title is assistant division aviation officers. Their job summary alone fills a page of single-spaced typewritten paper and includes 18 different responsibilities. They range from advising the commander on aviation matters, to scheduling courier flights, to controlling and scrambling fire teams of helicopter gunships in event of an attack on the base camp. MAJ Houser, a rugged, 30-year old career officer from Lincolnton, N.C., allows that all 18 missions are difficult at times, but says that allocating passenger spaces on the 30 courier flight sorties daily gives him most of his headaches. In a way, it's a wonder he even has time for headaches - the two majors have direct control over some 900 sorties a day. MAJ Newton felt getting enough ships was a big problem. "The real difficulty is that very seldom can we get enough ships for every mission. Therefore we have to set the priorities here - and they go primarily to combat missions." Sometimes he has to say no, but not often. TWA, with a staff of three officers and three enlisted men, serves an incredible area of 4200 square kilometers in Tan An, Long An, Tay Ninh, Binh Duong and Hau Nghia Provinces. Unfortunately, another of those 18 responsibilities is to monitor the use of all 900 sorties daily. "From three in the afternoon to eight in the evening, nobody even has time to sit down," said Houser, "the reason being that everybody's either finishing up their missions in a hurry or requesting new ones they forgot to ask for in the morning." Newton's face crinkled into a smile as he said, "But not everything is troublesome or depressing around here. Sure, we have problems like everybody else, but once in a while something comes up to provide a little comic relief. A few weeks ago we had a man at Long Binh who was waiting for a flight back to Cu Chi. "We had to send some inexperienced aviators after him and they didn't know the area very well. They went there and back three times without finding him, always landing about 50 meters from him, but on the other side of a minefield. He couldn't get their attention and he couldn't cross the minefield, so they flew back without him." Newton paused and laughed again and said, "You know? I think he's still there!" In a more serious vein, the major continued, "Our job is support. If someone makes a mistake and the men in the field don't get re-supplied, we don't take time out to criticize, we just get in there and get the job done." Satisfaction of accomplishment is as much a part of the (text is missing here - xerox copy wrinkle). You get a real good feeling inside when the gunships you've scrambled get a few VC. That's when you feel you've accomplished something," said Houser. In the eyes of the men in the field, Teenie Weenie Air isn't so teenie weenie after all. DAU TIENG - Beau is a 70-pound German Shepherd working with the 44th Scout Dog Platoon at Dau Tieng. He's friendly and wags his tail, but he's also an aggressive animal and has tasted the bitterness of war. With only five months of combat behind him Beau has been wounded on two different occasions - he almost died once. "It was on a three day operation," Sp4 Michael R. Phillips, Beau's handler, said as he described the first time the dog was wounded while working with the 3rd Bde., 4th Inf. Div. "We were moving out of a large clearing and had just reached a woodline when Beau alerted." Immediately Phillips dove for cover and the Viet Cong activated a well-planned ambush. "An AK-47 round struck Beau in the front leg," the 20-year old handler said. The wound wasn't serious and the dog, valued at $2500, was quickly back in action again when Operation "Junction City" was launched in the rugged War Zone C area. Phillips and Beau were sitting in a clearing preparing to move out when artillery rounds began piercing the air. "Beau gave a strong alert - his head was straight up," Phillips said. "That only meant one thing - the shells were coming at us!" Ten rounds later Beau and Phillips both lay wounded. A piece of shrapnel had passed completely through the dog's middle breaking part of his backbone, and then struck Phillips in the right arm. Evacuated to Saigon the dog's death certificate was filled out due to the seriousness of the wound, but Beau "didn't give up" and 39 days later the certificate was torn up. The dog is now back at the Ivymen's base camp. "I wouldn't trade him for any weapon," Phillips said. "He's my best protection. He can tell you where Charlie is." DUC PHO - After 66 days of ceaseless patrolling in sand, rice paddies, jungle and up 60-degree-inclined slopes in 106-degree heat, the 3rd Bde. Task Force, 25th Inf. Div. wrapped up Operation "Pershing" at noon on April 19. "Pershing" was not the brigade's longest operation, nor did it include the heaviest fighting the brigade has been in. "Pershing" did however, see the 3rd Bde. clear the NVA and VC from northern Binh Dinh Province, an area the enemy had been able to call home for a decade, in eight weeks time. "Tropic Lightning" represented by two battalions, had the biggest area of operation for the longest time of any similar sized unit on "Pershing". The "Cacti Green" concentrated on the Nui Mieu and Crescent areas, but, according to their liaison officer to brigade, 1LT Lawrence Connor, they managed to also patrol in and around Nui Gop Trat Mountain and the 506 Valley. On March 6 and 7 they engaged elements of an NVA battalion at Hoa Tan in the northern Crescent area, killing 81 in what was the brigade's largest battle during "Pershing". The 1st Bn., 14th Inf. continued to patrol and control the lower Soui Ca as they had during "Thayer II." The "Golden Dragons" emphasized ambush and deception tactics. CPT Scott's "Can B Done" Company heli-assaulted into LZ "Corral" in February where they engaged an NVA company which could not be persuaded to stay and fight. It is believed to have been the battalion's biggest engagement of "Pershing". Co. D, 65th Engrs. accomplished a "first" in "Pershing" in opening Highway 506, a dirt road that cuts through the hostile 506 Valley. They were consistently harassed by enemy sniper fire, mines and once by an NVA platoon. Their attempt marked the third engineer try to open the road. On "Pershing" the brigade mixed civic action and military tactics more deliberately and conscientiously than ever before. Coordination was made with ARVN units and district on a daily basis. Before a U.S. unit moved out of an area, co-ordination was made with the ARVNs, so control of the area would not slip and so projects could maintain their momentum. DAU TIENG - A pert Irish colleen from County Mayo, Ireland, paid a visit to her cousin here at the 3rd Bde., 4th Div. base camp recently - a cousin she had never met. Miss Claire Hoban, an auburn-haired, green-eyed 23 year old miss, works in the PX of the 25th Div. at Cu Chi selling cars. She heard that there was another Hoban, also from County Mayo here with the "Ivymen." On her day off, she hopped a chopper to Dan Tieng and after a few inquiries was talking to her cousin, PFC Brendan T. Hoban, a rifleman with Co. C, 3rd Bn., 22nd Inf. "We had never met before and I didn't even know whether we were cousins or not until we straightened out some aunts and uncles," commented Miss Hoban. 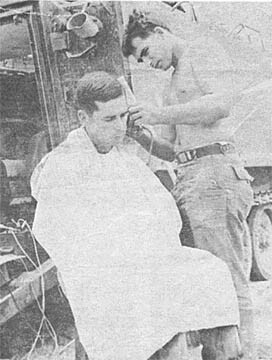 BARBER SHOP (MECH) - PFC Albert Warfield of Co. B, 1st Bn., (Mech), 5th Inf. opens the "Bobcat Barber Shoppe". "Fair Hair Care in a Strac Track." Rung Cay is a tiny hamlet just outside the Operation "Manhattan" base camp of the 25th Inf. Div. 's 2nd Bde. The road running through Rung Cay had been mined by the Viet Cong frequently during the first days of the operation, slowing traffic on that main supply route. Somehow the people of Rung Cay had to realize that the Allied effort being made to their north was to help them, and that they could help by pointing out Viet Cong mines. The answer was a Medical Civil Affairs Program (MEDCAP) combined with food and clothing distribution. The program would include distribution of leaflets explaining the Allied effort and offering a reward to villagers who pointed out VC mines. The biggest problem was that no one had ever held a MEDCAP in the hamlet before. Civil Affairs officers didn't know what kind of reception would greet them. 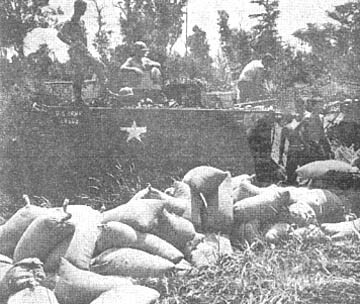 The morning of the MEDCAP, another mine had been found just north of the hamlet, and there were reports of a Viet Cong unit operating in the area. The 90-man security force that had been planned for to protect the program was assigned another mission at the last moment. MAJ Gordon Corcoran, brigade Civil Affairs Officer, decided to go without them. The tiny convoy of five vehicles rolled out the base camp just before noon and jostled its way down the muddy road to Rung Cay. The four men in the lead vehicle all kept a constant watch to the front for the telltale bumps of freshly packed earth that meant mines. "All I could think of as we entered the hamlet was the rule that if you saw a lot of kids running around, the VC probably were not in the area," said CPT Donald Harmon, Civil Affairs officer of the 1st Bn., 27th Inf. There was no one. Houses looked deserted and rakes were left leaning against trees in the fields. As the group approached the center of town, a high-powered public address system in the lead vehicle was switched on and an interpreter began to tell all villagers who could hear why the vehicles were coming into their hamlet. By the time the group reached the hamlet square, a few children were cautiously walking toward them. More and more people began to appear as the district chief used the loudspeaker to explain what the Allies were doing in the area and why they were in the hamlet. Medics set up examining stations for the doctors from the 1st Bn., 8th Arty., and the 1st Bn., 27th Inf. By the time the stations were complete, long lines stretched away from them. 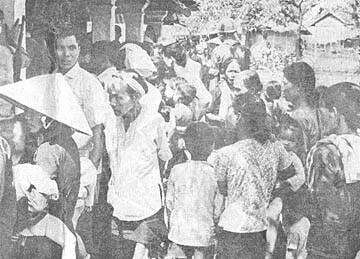 As the doctors worked, arrangements were made with the village chief for distribution of food and clothing. Leaflets were handed out explaining the Allied effort and asking that the people help by pointing out mines in the hamlet's roads. Everyone smiled and laughed as even more people came. Before the day was over, the doctors had treated more than 180 patients. Civil Affairs workers distributed through the village chief, 72 gallons of cooking oil, 500 pounds of rice, 250 tubes of toothpaste, 2,500 bars of soap, and more than 1,000 pounds of clothing. "We felt a lot better leaving the village than entering," said MAJ Corcoran, "the people waved us off like old friends when we left." Did the MEDCAP do the job intended? It probably will never be proven one way or the other. But there were no mines found in the road through Rung Cay up to the writing of this report five days later. 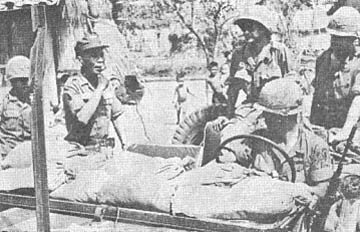 HERE TO HELP YOU - The district chief tells the villagers why ARVN and U.S. soldiers have come to their town. The loudspeaker system reaches most of the villagers in and around the town. SUSPICIOUS EYES - (Left) The children were the first to show their faces, but they didn't appear to be too eager. CONFIDENCE GAINED - (Right) The children stretch for all they're worth to get a newspaper from CPT Don Harmon. 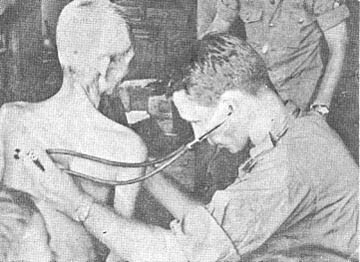 NOW EXHALE - (Below) CPT Joseph A. Morgan of the 1st Bn., 8th Arty., listens to the heartbeat of an elderly man during the MEDCAP. NEW FRIENDS - The people of Rung Cay gather around the entrance of the building used for the MEDCAP after losing some of their apprehension over the strangers. Food, clothing and soap were given to the people. DUC PHO - SGT James A.Hull, five-time recipient of the Purple Heart, has had his share of ups and downs. He had received four Purple Hearts for actions in Korea, and three weeks after he arrived in Vietnam he was in the hospital with malaria. He returned to his unit, Co. B, 1st Bn., 35th Inf. (the same Battalion he was with in Korea) only to trip a Viet Cong boobytrap. Wounds from the shrapnel sent him back to the hospital where he was, presented his fifth Purple Heart. Resolved to give a little instead of. take so much, SGT Hull went back to his unit for a third time. A week later, as he sat behind a clump of brush reading a letter, three laughing North Vietnamese Army regulars, who were obviously returning from a fishing trip, approached him. Hull opened up and brought them to the ground with a burst from his M-16. His latest incident was with a 150-pound test fishing line found tied to a bridge. "This isn't anything but a fishing cord," Hull said as he brushed against the line. After four minutes of tracing the line, Co. B came to the other end and a hand grenade attached to a 500 pound bomb. With a sigh of relief because he hadn't tripped the boobytrap, Hull said "Maybe my luck is about to change!" Installing and maintaining the entire wire communications system for a combat brigade is a big job. For SGT Matin R. Solman of the 25th Inf. Div. 's 2nd Bde. it's also a very interesting job. SGT Solman, of New York City, is the wire foreman for both the brigade rear and combat forward base. First into a new area and last out is the rule for the two wire teams he heads. "Keeping dependable commo going in the field means long hours. It's very challenging work," says SGT Solman. Three civilians were killed and six seriously wounded in a two day period by Viet Cong mines in an area south of the Operation "Manhattan" zone of operations. An old man and two young children died when a Viet Cong mine blasted their oxcart on a heavily traveled civilian road north of the city of Trang Bang. Six mining incidents have taken place on the stretch of road that links Trang Bang to a small hamlet and the forward base camp of the 2nd Bde. of the 25th Inf. Div., in the two weeks since the beginning of the massive operation. "This is the second time in as many days that the Viet Cong have killed or wounded innocent civilians with explosive devices," said Maj. Lynn Steverson, a 2nd Bde. staff officer. The day before the mining incident, six civilians were seriously wounded when the VC employed a command detonated mine against them. The road has been used for military convoys supplying the base camp but is heavily traveled by civilians. DAU TIENG - The man responsible for gathering almost 3000 draftees together at Fort Lewis, Wash., training them as a fighting unit, and then bringing these men to Vietnam where they have fought in six major operations, has left the 3rd Bde., 4th Inf. Div. COL Marshall B. Garth has been reassigned to the office of the Joint Chiefs of Staff at the Pentagon after commanding the Ivymen for the last 16 months. "You men are the smartest and most capable men that I have had the privilege to serve with in 26 years of service," Garth told the brigade as he made his farewell speech. "You are the greatest soldiers our Army has ever produced." "If I did what I feel like doing," the colonel said in an aggressive voice, "I would dig my heels in and they would have to drag me away." The colonel, taking numerous risks right along with his men, supplied the needed punch to defeat the 272nd Viet Cong Main Force Regiment when the enemy unit decided to attack a brigade artillery support base while on Operation "Junction City." He was awarded the Silver Star for his actions. MG Frederick C. Weyand, former 25th Inf. Div. CG, has been named to succeed LG Bruce Palmer as commander of II Field Force in Vietnam. GEN Palmer will become a deputy to GEN William C. Westmoreland, the U.S. commander in Vietnam. GEN Weyand will be promoted to the three star rank with the change. BONG SON - Bronze Stars were presented to all members of one hard-fighting, LZ-cutting squad of engineers by their company commander, CPT Arthur. J. Pansze at the 3rd Bde. Task Force, 25th Inf. Div. forward command post. The men of Co. D, 65th Engr. are: SSG Richard D. Foreman of Des Moines, Iowa; SGT Gary L. Dulaney of Rock Island, Ill.; SP4 Earl S. Baker of Jacksonville, Fla.; and SP4 Jackie L. Green of Bostic, N.C. The four men were with the 1st Bn., 14th Inf. in Nov. when the "Dragons" engaged two North Vietnamese Army battalions west of Plei Djereng. The engineers immediately began cutting a landing zone for resupply and medical evacuation. They operated chain saws, planted and exploded demolitions, resupplied the infantry with ammunition, retrieved U.S. dead and wounded and got them on the helicopters, and administered first aid - all the time under steady enemy fire. It marked one of the few times a whole squad was decorated for the same action and the first time a Co. D, 65th Engr. unit has been so decorated in Vietnam. The 65th Engr., nicknamed the "Whiskey Fifth" for reasons best known only by themselves, are still the "First In, Last Out." DAU TIENG - On the morning of April 30, 1967, in the course of his duty on the bunker line of the 3rd Bde., 4th Div. 's Camp Ranier at Dan Tieng, Sp4 James R. Brown, Hq. Co., 2nd Bn., 12th Inf., was suddenly and unexpectedly relieved from his post. The relief, a four foot long cobra, quietly slithered into the bunker about 10 in the morning after first pausing, briefly to inform Brown he was taking over. Brown, understandably not appreciating the relief, made an unsuccessful last ditch effort to persuade the snake otherwise by dropping a box of claymore mines from the top of his bunker onto the snake. Shortly thereafter, reacting to a call for help from Brown, SGM Mullins and MSG Therriault from battalion headquarters appeared on the scene complete with smoke grenades, tear gas, and their .45 caliber pistol. After one tear gas and two smoke grenades were tossed into the bunker and still no sign of movement, sand bags were removed from the top of the bunker in an attempt to catch a glimpse of the intruder. Therriault then approached the bunker with a club in one hand and a .45 in the other, but the tear gas kept him from getting too far. Some four hours after the original encounter, the tear gas was still so strong that it was impossible to enter. Brown operated from a water can some twenty meters to the rear of the bunker until the gas cleared. A detailed search made with utmost caution revealed no trace of the beleaguered snake. The 196th Lt. Inf. Bde. is now taking orders for its 112-page yearbook, "The Second Year." 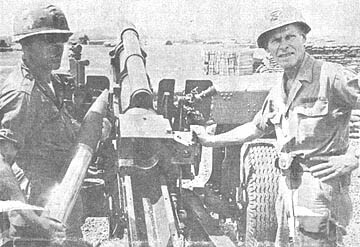 The pictorial review of the brigade's activity in Vietnam costs $5. A postal money order may be made payable to: Information Officer, Hq., 196th Light Infantry Brigade (Sep), APO SF 96256. All orders must reach the Information Officer no later than June 5. Personnel should include their present address and their permanent home address along with their orders. Anyone may buy a copy of "The Second Year." DAU TIENG - While cutting lanes of fire, PSG Richard L. Bartels of Tampa, Fla., stumbled onto a well concealed cache of rice. "I've been in Vietnam over six months," said Bartels, a member of Co. B, 2nd Bn., 22nd Inf., "and this is the most elaborate cache I've ever seen. There was aluminum siding for a roof, sides, and bottom of the hole. The floor and sides were raised about one foot from the surrounding ground. Even the wood frame was joined by mortise and tendon wood joints." The 8 by 8 by 20 foot cache held 250 one hundred pound bags of polished rice. They were evacuated for use in the brigade civil affairs program. 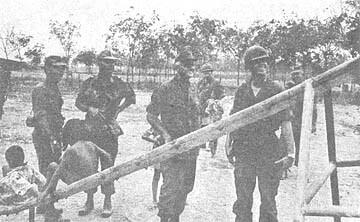 It is felt that the area of operation near the Boi Loi Woods in War Zone C houses the Viet Cong apparatus for control of terrorist activities in the Saigon area. "That's a roger, sir. We caught Charlie with his pants down." That was the report sent in by SGT William L. Kelley, a squad leader from the 1st Pit., Co. C, 1st Bn. (Mech), 5th Inf. Bobcats." A platoon size base camp had been found with laundry drying on the line and at least one VC was observed leaving the scene with no pants on. Three large bunkers, 30 foxholes, 800 pounds of rice and warm food still on the table were found along with a picture of Mao Tse-Tung.